A key feature of BEAST is the ability to specify dates for individual sequences (i.e., tips in the tree --- so called tipdates). This is important when the organism being studies is evolving on the same scale as the time range of the tree. Common cases of this are fast evolving pathogens such as viruses and bacteria or DNA recovered from relatively ancient material such as sub-fossil bones. This pages walks you through how to specify these dates within the user interface of BEAUti. By having sequences sampled through time, BEAST is able to estimate the timescale of the tree and the rate of evolution. See Rambaut (2000) for a description of how this is done (albeit in a maximum likelihood rather than Bayesian context). See Dummond et al 2003 for a review of the idea of ‘measurably-evolving populations’. Dates are generally specified as a calendar date such as 4 May 1971, an amount of time since some point in the past such as 200 days since diagnosis, or an ‘age’ such as 10,000 years before present. Which ever way they are specified, BEAST will convert these dates to a standard time axis that runs backwards from the most recent tip which becomes the zero point in the axis. If provided as calendar dates then the timescale will be in units of years. For other forms of dates the units of time will be that of the dates provided - days, years, thousands of years etc. Within BEAST, times on this timescale are referred to as ‘heights’ — i.e., root height, node heights etc. — which comes from terminology in computer science where trees are drawn with tips at the bottom of the page and the root at the top so its time scale is how high up the page it is. In the image above, the first sequence has been given the date 1993 and BEAST has given it the height of 0 (it is now the most recently sampled sequence). All the other sequences have a height of 1993 — i.e., BEAST thinks they have been sampled 1993 years before the first one in the year 0 (technically, in the Gregorian calendar there is no year zero but we can ignore that poor decision). So we need to set the dates for all the other sequences. For convenience when many sequences have the same date, you can select multiple rows in the table and then click the Set Dates button to set the same value to all of them. You can also Clear Dates for selected rows but that is the same as setting their date to zero. Note: If the dates are actually ages (i.e., time since the present) they can be specified as negative numbers. In this case, zero will be assumed to be the present day. This operation attempts to guess what the dates are from information contained within the taxon names. Generally this works by trying to find a numerical field within each name. If the taxon names contain more than one numerical field (such as the RSV sequences, above) then you can specify how to find the one that corresponds to the date of sampling. You can either specify the order that the date field comes (e.g., first, last or various positions in between) or specify a prefix (some characters that come immediately before the date field in each name). For the RSV sequences you specify the prefix @. In this dialog box, you can also get BEAUti to add a fixed value to each guessed date. In this case the value “1900” has been added to turn the dates from 2 digit years to 4 digit. Any dates in the taxon names given as “00” would thus become “1900”. If these dates were actually referring to the year 2000 then selecting the next option would convert them correctly, adding 2000 to any date less than 17. When you press OK the dates will appear in the appropriate column of the main window. You can then check these and edit them manually as required. If you click the column heading for the ‘Date’ column it will sort the rows in ascending order of date. Click again and it will show sort in descending order. 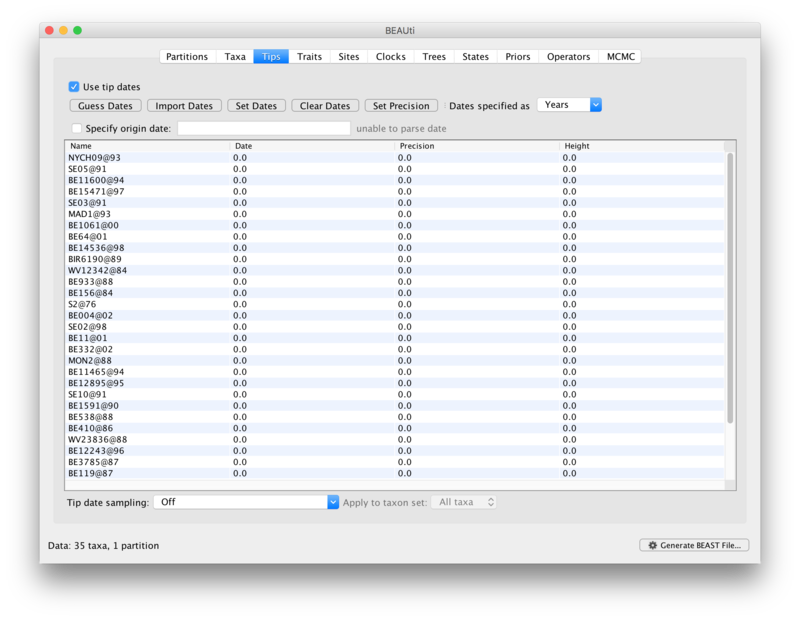 This allows you to check the extremes for mis-parsed dates. 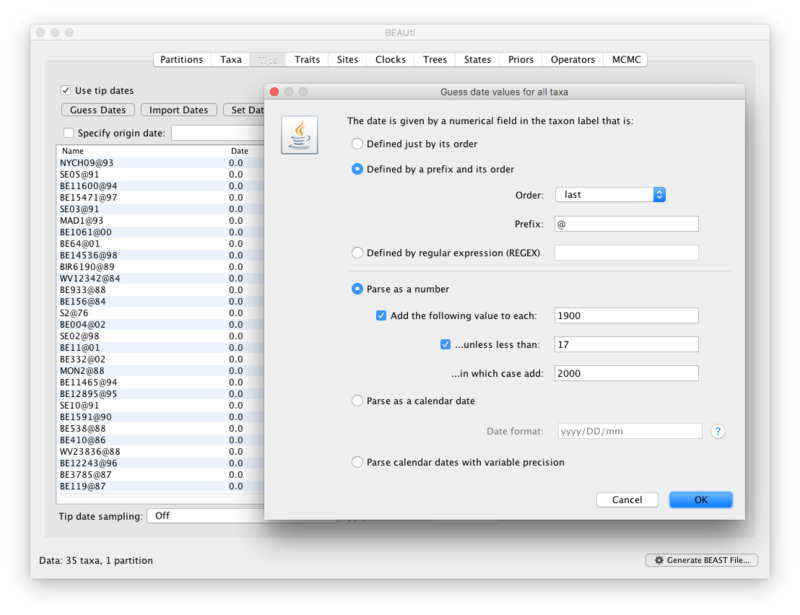 This dialog box also provides a wide range of other options for extracting dates from taxon labels. The first half specifies how to find the dates in the taxon labels and has 3 options. This option detects entirely numerical fields (i.e. containing only digits, ‘.’ and ‘-‘) separated by non numerical characters and then uses the Order menu to specify which of thes is the date field (e.g., always the first one or the second from last). This option finds fields that are prefixed by a particular character or string (e.g., the @ symbol, above) and then uses the order to specify which one. A regular expression or REGEX is a flexible way of matching parts of complex strings widely used in computer science. It is beyond the scope of this document to describe the full potential of this but here is a good description. As an example, the pattern \d\d\d\d-\d\d-\d\d would match any date string formatted like 2017-08-01 (the \d matches any digit). We used this option above. It basically assumes the date is a number. It may be a year or a number of days or it can be a decimal number in what ever units (positive numbers are from some time in the past, negative are from some time in the future). The suboptions here are as described above. Here we assume the date is specified in one of the standard formats which is specified in the Date format box. These date formats are very flexible and can specify how to parse most date formats. Click the ? button to see a description of the format. As an example, dd/MM/yyyy would denote the globally common day month year notation (MM/dd/yyyy would be the US’s confusing alternative). This is parses very specific way of specifying dates which is by far the most reliable (it is used widely as the format for databases and other computer systems because of its unambiguity. This format is the equivalent of using yyyy-MM-dd in the box above (an example date being 1971-05-04). This format has an additional advantage is that the day can be ommitted (1971-05) if it is not known. Both the day and the month can be ommitted if only the year is known (1971). When using this option (as opposed to the previous one) cases where the day or day and month are ommitted are noted and the uncertainty is recorded in the precision column. This has two benefits - firstly BEAST will place the tip in the middle of this date range (which if you don’t know when in 1971 your sequence was sampled, is probably a good choice). Secondly, it allows the uncertainty in the date to be correctly accommodated by BEAST - sampling over the date range. For more details about this, see the Tip Date Sampling how-to. Warning: For unambiguous writing of dates, the yyyy-MM-dd is the only one that should be used. This format is even an ISO standard. It even has an XKCD cartoon. Do not even consider using a different format. If you get a date like 4/5/1971 how is anyone supposed to know whether it is the 4th of May or the feast day of Æthelburh of Kent? Just like the Set Dates option, if you select certain rows and use Guess Dates it will only extract dates for those taxa (you can then use a different option for others). This dialog provides the same options for specifying how the dates should be parsed as above. Any rows in the file that cannot be exactly matched to a taxon lable will be ignored and any taxa that don’t have a row in the file will not have a date specified (they will remain at zero). Rambaut (2000) Estimating the rate of molecular evolution: incorporating non-contemporaneous sequences into maximum likelihood phylogenies. Bioinformatics, 16: 395-399.